My mom loved to talk. 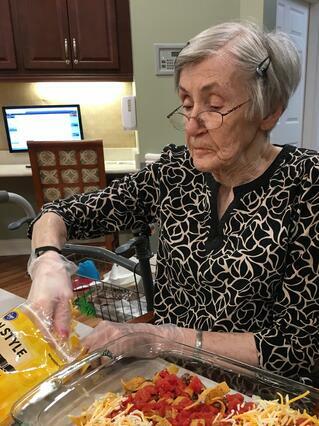 She could spend hours at her favorite coffee shop in her hometown of Cleveland, Oh, talking to customers and staff, gabbing at Bingo, talking and laughing on the phone with her sister, and participating in family gatherings at her house. She would even stay up late at night chatting she had so much to say! But as her problem finding the right words became worse, I noticed that she wasn’t participating in family get-togethers like she once had. She became anxious and withdrawn, and we visited her doctor again, who suggested that reading out loud might help, but mom never saw much benefit from doing so. A specialist in dementia examined my mom, asked her a lot of questions, and did a CAT scan of her brain. We were given a diagnosis of Frontotemporal lobe dementia (FTD, formerly called Pick's Disease). Knowing a limited amount of information about dementia, I turned to the internet and began reading - I did not like what I read. The form of FTD mom had was Primary Progressive Aphasia (PPA), which is a progressive disease that affects language skills, speaking, writing, and comprehension. Eventually motor skills are impacted with muscle stiffness, difficulty walking, and changes in posture. It also affects eye movements. We have a small family. My father is deceased, and so there was only my brother and me to care for mom. I wished over and over again that we had a sister who could help us understand better what mom needed, and to help her with female-related issues like visits to the gynecologist. As a son, I felt it was my role to protect mom, but I was uncomfortable deciding about best care options. There were more challenges that first year. At first, mom could do her grocery shopping with just a little help from me when she needed to do things like tell the meat counter person how much beef she needed. Her memory was still sharp, and she usually got everything she needed without the help of a list. The outings were good for her, too, as she could lean on the cart and get in some exercise walking the aisles. As her limitations increased, we noticed mom was having difficulty determining what she needed at the grocery, and shopping took longer and longer. On one particularly bad day, it took her almost three hours to finish shopping, 45 minutes of which was spent picking out a birthday card. It was like she just couldn’t discern what she needed from what she didn’t. Still, mom and I typically enjoyed these outings together and we made sure she always got her favorites - pastries, cookies, and popsicles! It was always amusing for the two of them to play Bingo. Given that mom couldn’t speak for herself, Candi would yell, “Bingo!” for both of them, and other players would get aggravated that Candi was winning so often! Candi and mom laughed and smiled, and after outings with Candi, mom would be beaming. She became such a part of mom’s life that even after mom moved and we cancelled the service, Candi continued to visit her. We were very thankful for Candi’s friendship and influence in mom’s life. I visited the Ganzhorn Suites, received a tour, and met with the staff. What I saw was impressive - not all residents were treated alike. The staff seemed to recognize each resident had different needs and wants, symptoms, disease stages, and various physical and cognitive levels. For us the final decision came down to the fact that mom’s physician was on staff there. We decided to try temporary respite care for the two weeks my brother was out of town. We thought this would allow us to see if mom adjusted well, and if this was the best place for mom and us. To us this seemed like the perfect place for mom to stay. She was getting more stimulation than she did at the apartment, where she was prone to lie on the couch and watch television, or occasionally read a gossip magazine. At Ganzhorn, we knew her needs with regard to safety, nutrition, and companionship would be met. However, when the two weeks were up, mom began packing and getting ready to return to the apartment. When my brother broke the news to her that we felt is was best she stay at Ganzhorn, she cried. Once again, the staff at Ganzhorn helped us. They got mom involved in activities and provided regular updates to my brother and me. He and I took turns visiting mom daily, which allowed us the opportunity to meet the staff, and see for ourselves that mom was settling in, and had lots to do: painting, bingo, card playing, baking cookies, etc. We saw mom smile and laugh and build friendships with residents and staff. She started getting up earlier and staying up later, and even voluntarily heading down to the fitness room to use the stationary bike. Each time I left the center I replayed the time with her in my head. Some days were good and some were bad, and I would never know from one visit to the next what to expect. I remember a relative telling me this process is a roller coaster ride with many ups and downs, and we had no crystal ball to tell us what was in store the next day, the next week, or the next month. Since mom’s passing my cell phone doesn’t ring anymore with bad news, but I feel like I have too much time on my hands. When mom lived in Cleveland, I saw her about seven times per year, but after her move here I saw her almost every day for several years. I built friendships with the residents and staff at Ganzhorn, and still attend a support group there. She, and the people in her life, became part of my daily life - her journey through this disease became our family’s journey, too. But now our journey without mom has begun. I expect there will be good days and bad days, and even though we will never hear her words again in person, from heaven I am convinced we will hear her words again.